If you aren’t reading the New Extended Canon (EC) Star Wars novels, you’re really missing out. Ever since my friend Rachel got me hooked on the EC, I’ve made it a goal to get everyone I know hooked as well. The characters are excellent, the stories diverse and nuanced, and the themes and messages deep, thoughtful, and relevant. They aren’t fluff or filler; they’re necessary elements of the Star Wars franchise that expand upon and fill out what we only get to see briefly in the films (ask me about that later, I have a piece planned). Claudia Gray’s Lost Stars is the example par excellence of what EC Star Wars is all about. Lost Stars was published in 2015, so I’m admittedly behind the game in getting this review out. However, because of how exemplary this novel is for the EC and how great a novel it is on its own merits, it’s worth talking about now. Especially given how, ah, divisive The Last Jedi has been for the fandom. Spanning the entirety of the Original Trilogy (OT) and then some, Lost Stars offers a unique perspective on the events of the OT: that of an Imperial officer and an Imperial defector to the Rebellion. 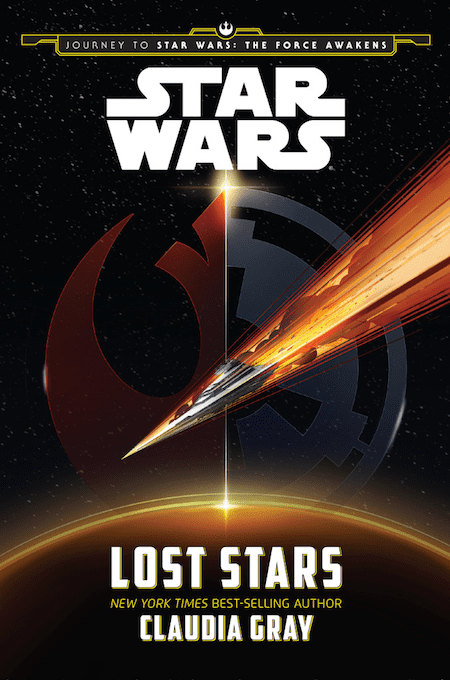 Even if you hate the Sequel Trilogy with a passion, you really don’t want to miss Lost Stars. The reign of the Galactic Empire has reached the Outer Rim planet of Jelucan, where aristocratic Thane Kyrell and rural villager Ciena Ree bond over their love of flying. Enrolling at the Imperial Academy together to become fighter pilots for the glorious Empire is nothing less than a dream come true for the both of them. But Thane sours on the dream when he sees firsthand the horrific tactics the Empire uses to maintain its ironclad rule. Bitter and disillusioned, Thane joins the fledgling Rebellion—putting Ciena in an unbearable position to choose between her loyalty to the Empire and her love for the man she’s known since childhood. Now on opposite sides of the war, will these friends turned foes find a way to be together, or will duty tear them—and the galaxy—apart? Full confession: I love Claudia Gray. Her novels exhibit a level of artistry in writing characters and themes that take me aback every time. Her prose manages to be both highly evocative and approachable to a broad range of reading levels. She’s a master of subtle yet plausible fanservice. Characters we love from the OT—like Luke, Han, Leia, and even side characters like Mon Mothma and Admiral Ackbar—enter our protagonists’ sphere in ways that make sense and never linger beyond what’s reasonable. Her worldbuilding is likewise excellent. She writes the Star Wars universe as well as any other of the EC writers I’ve read, but what I love most is her attention to cultural details. Creating convincing alien species and cultures takes a lot of skill. Remembering to also provide cultural differentiation for human settlements takes an equal amount of skill, and not every writer remembers to do that. Gray makes cultural differences more than about dress, appearance, physiology, or large-scale religious differences. Small details like mourning rituals, formal declarations of loyalty, and a special practice for carrying on the memory of a dead twin add to the sense of realism of her characters and their cultural heritage. As was true in Leia: Princess of Alderaan, her pacing is slower than most YA novels, but that doesn’t mean there’s no action. She writes action sequences well; the finale is damn near cinematic. At the same time, the vast majority of her tension occurs within the characters. Gray knows how to use third person intimate to its best effect. The juxtaposition of different viewpoints on the same event is especially effective for character development and maximum tragic irony. Whether it’s divided loyalties, internal versus external honor, duty versus love, ideals versus reality, or cynicism versus faith, Gray knows how to write internal conflict superbly well. She’s especially good at writing characters whose sense of duty is at odds with their ideals or inhibits their emotional vulnerability. (Basically, she knows dutiful princesses inside and out.) She crafts interactions where misunderstanding makes tragic sense without feeling forced or needlessly complicated. Her skill in this regard is on full display with Ciena and Thane in Lost Stars. They’re not just literally star-crossed lovers on opposite sides of a war (though they are that). Ciena and Thane are the kind of people who start out believing that they know everything about what the other thinks and feels. They can predict each other’s moves with uncanny precision one moment but still misunderstand the motives and goals of the other the next. Because no matter how much we know someone, they can still surprise us. It’s a delicate balance, and Gray handles it deftly. Gray also excels at writing interesting secondary characters with only a paragraph or two. Lohgarra—a mom friend Wookiee Thane co-pilots for—is one of my favorite secondary characters and her page time might be somewhere around 10 pages. Ciena’s former roommate at the Imperial Academy Jude is a delight, and Nash Windrider, one of Thane’s former roommates, has one of the most fascinating character arcs in the whole book. On the aesthetic side, the cynic/idealist is one of my favorite romantic pairings. Plus, Lost Stars is basically an entire novel of angst and mutual pining, which I am a huge fan of when done well (and this is done really well). That’s it. That’s the book. It’s an honest love story, one with powerful connection and loyalty on the one hand but with the potential for devastating misunderstanding on the other. True, most people don’t know what it feels like to possibly be the person to shoot down your best friend/lover’s plan in battle, but we all know what it means to fear hurting someone we love because of a difference of opinion. The stakes are higher for Thane and Ciena, but that just makes the story that much more gripping. Lost Stars shows us that there are as many reasons to be a part of the Empire as there are to be a part of the Rebellion. It isn’t all black and white. Not everyone who joined up with Leia and co. did so because they believed in the ideals of the New Republic. Not every Imperial joined up to coldly exploit the galaxy. Cynics can be Rebels; idealists can be Imperials. Not every Alderaanian approved of the Organas. When watching the OT and PT, it can be easy to think that the tyranny and corruption at the heart of the Empire was always obvious to everyone. But it wasn’t, and Lost Stars tackles that thorny issue head on. We see that for many, the Empire felt like a necessary corrective to the chaos of the Clone Wars. It brought a sense of stability, of ‘law and order’ that at first appeared healthy and safe. Before the depth of Palpatine’s depravity became widely known, the Empire offered a measure of freedom, advancement, and a sense of purpose for those from back water planets, ‘low’ birth, or chaotic homes. Staying within the Empire isn’t so clear cut either. Through Ciena’s eyes, we see a wide range of explanations for staying from true belief, to a cultural commitment to loyalty, a desire to fix what’s broken, and a sense of responsibility for those under her command. Some of these reasons are more sympathetic than others, but the larger truth behind them is that not everyone within the Empire is a hateful monster. It can take a long time for the rot at the core of an apple to infect the outer flesh and in the meantime, a lot of well-meaning, good people can be tempted to bite into it, only to get sick. We might initially be tempted to think we’re a Thane, but most of us are more like Ciena than we’d care to admit. Ciena’s self-delusion and slowly unfolding sense of betrayal is mesmerizing in its honesty. The moment she meets Palpatine is heavy, terrifying, and raw because we sympathize with her. We, too, could have and have been that person who didn’t believe they were serving something truly horrible until it looks them in the face (especially if we’re someone who has any degree of privilege in our current society). Lost Stars also highlights the many paths to doubt and disillusionment and that one’s reaction to those feelings isn’t always the same. Ciena didn’t see the atrocities Thane did first hand, but neither did Thane have to experience the personal betrayals Ciena did. And neither of them were native Alderaanians like Nash Windrider, an Imperial officer who witnessed the destruction of his planet from the ‘other side.’ With these three characters and others, we see that coping takes many forms, some healthier than others. Sometimes people double down on their original beliefs. Others seek a way out through defection and still others through self-harm and suicide. We also see just how much one’s culture and family history can shape one’s perspective on the same situation. Gray tackles some of the most pressing questions that face us today when it comes to systemic oppression and injustice. Do all good people go bad in a corrupt system? What is the best pathway to change? When do we abandon a corrupt system and when do we try to change it from within? Is disloyalty to a corrupt system different from the disloyalty of that system to the people it’s meant to take care of? How? To what degree is responsibility for systemic injustice shared at every level and what ought to be reserved for those in positions of more power? Should we take motivations into account when condemning those who participated in a corrupt system? The answers to these questions are complicated, and Gray never lets us simplify them. …but that doesn’t make her characters any less real or honest. Gray generates sympathy and pathos without ever justifying the horrors committed in the Empire’s name. It’s truly remarkable and one of the most nuanced pieces of storytelling I’ve read in years. Gray never shies away from depicting the human cost of war either. For all who have complained that the OT didn’t deal enough with the casualties of war and the losses inflicted and suffered on both sides, this is your book. We can get so focused on Alderaan (justifiably so) that we forget that the Death Star would have been a similarly traumatic event for the Imperial officers. They, too, lost friends, loved ones, and colleagues. The scale is different, of course, but the grief and trauma isn’t. We can acknowledge the trauma of both situations without equating their actions. That’s the beating heart of Lost Stars, the story beneath the doomed romance of Thane and Ciena. We can acknowledge the pain, suffering, trauma, and even the differing motivations of those who ideologically disagree with us without justifying or excusing the horrific acts committed by them and the system they participate in. We can humanize without moral equivalence. I can see and validate your grief without that meaning I agree with you or what you’ve done. It’s a difficult balance to maintain, admittedly. And one that’s getting harder to do in our culture of extremes. But it’s a necessary nuance if we’re ever going to fix our fractured society. We have to humanize the other side because otherwise, we’re at risk of losing what we stand for. At 550 pages, this book is a commitment, I grant you. However, Gray’s style is so readable and the story so gripping that the time flies. I read it in two days while also doing my normal level of other work. Plus, it’s totally worth it. Lost Stars is must read for SW fans of all ages, even ones who hate the Sequels, even ones who are more into the OT and Legends. It’s the best that EC has to offer, in my opinion, and what I’d recommend to people who want to read EC novels if they’re not looking for specific character driven novels like Leia, Ahsoka, Rose, or Luke. This article is a reprint (with minor modification) of an article originally published by Gretchen on TheFandomentals. Gretchen, 30s, bi, she/her. I write original SFF, ASOIAF meta and parodies, and essays about storytelling, representation, media, and fandom.